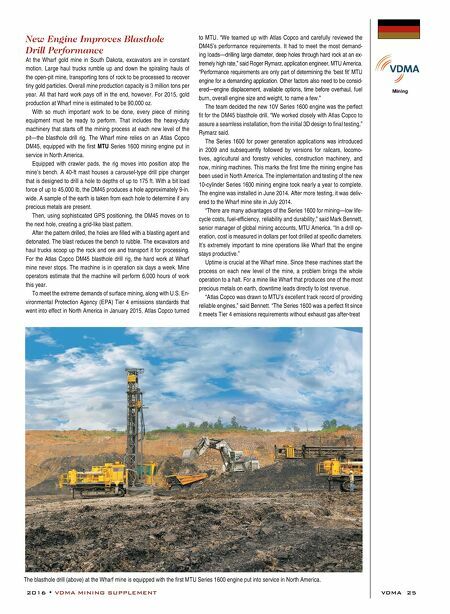 24 VDMA 2016 • VDMA MINING SUPPLEMENT Liebherr Dozer: Liebherr's PR 776 crawler tractor pushes more than 18 m 3 of rock. R 9200 cycles faster and consumes less fuel without sacrifice. Efficiency is further enhanced through the use of on-demand cooling control for both water and oil. The independent cooling circuits eliminate parasitic loss while diverting power to the attachment. By eliminating heat, the R 9200's components operate at their most efficient temperature; efficien- cy leads to lower cost and a longer life. The R 9200 is designed with service simplicity in mind. Extended service intervals and purposeful system layouts make the R 9200 easy to service; minimizing downtime and lowering operating costs. Acces- sibility of the upper structure is of key note, a powered 45° stairway directs the maintainer to the centralized major service points, which can be quickly and easily reached from this single-level service platform. The engine, too, is surrounded by wide platforms leading to effortless and safe access to the maintainer. Liebherr, in consultation with its mining partners, consistently sets the standard for advanced equipment design and technology. Specifically designed for extreme mining conditions, the R 9200's outstanding reli- ability and easy serviceability provides maximum uptime. The R 9200 is built on a 50-year foundation that combines experience with innovative thinking, world-class engineering and manufacturing excellence. Liebherr also recently unveiled the new PR776 crawler tractor, which is powered by a Liebherr 12-cylinder diesel engine developing 565 kW (768 hp). The dozer has a maximum operating weight of 74 mt and is equipped with blade capacities of 18 m 3 (semi-U blade) or 22 m 3 (U blade). The modern drive concept of the new PR 776 offers an extremely efficient and safe operation to customers. A new feature in this machine class is the infinitely variable hydrostatic travel drive, which is used for all crawler tractors from Liebherr. Another advantage of the mod- ern drive concept is the optimization of pressure flow. Hydraulic servo pressure is based on demand according to the task. If, for example, the full feed of pressure supply is not required when operating, this is automatically returned. The ECO function is standard for all Liebherr Generation 6 crawler tractors, including the new PR 776. It allows operators to choose be- tween high performance and maximum efficiency. The ECO control system enables greater travel drive efficiency in light to medium op- erations, and also provides greater fuel savings. The proactive power control is another innovation of the sixth generation crawler tractors. Internal engine and external machine parameters are recorded, such as the current deflection of the joy- stick. If required, the engine power is automatically increased for a brief period based on the current requirement. As well as respond- ing more rapidly, the machines offer a significant increase in per- formance potential and pulling power and a higher reverse speed. 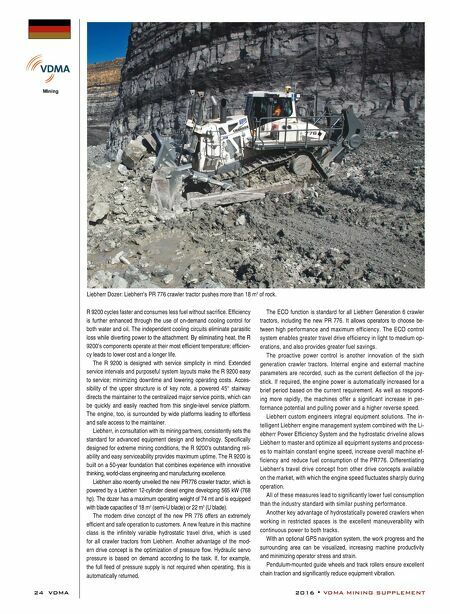 Liebherr custom engineers integral equipment solutions. The in- telligent Liebherr engine management system combined with the Li- ebherr Power Efficiency System and the hydrostatic driveline allows Liebherr to master and optimize all equipment systems and process- es to maintain constant engine speed, increase overall machine ef- ficiency and reduce fuel consumption of the PR776. Differentiating Liebherr's travel drive concept from other drive concepts available on the market, with which the engine speed fluctuates sharply during operation. All of these measures lead to significantly lower fuel consumption than the industry standard with similar pushing performance. Another key advantage of hydrostatically powered crawlers when working in restricted spaces is the excellent maneuverability with continuous power to both tracks. With an optional GPS navigation system, the work progress and the surrounding area can be visualized, increasing machine productivity and minimizing operator stress and strain. Pendulum-mounted guide wheels and track rollers ensure excellent chain traction and significantly reduce equipment vibration.